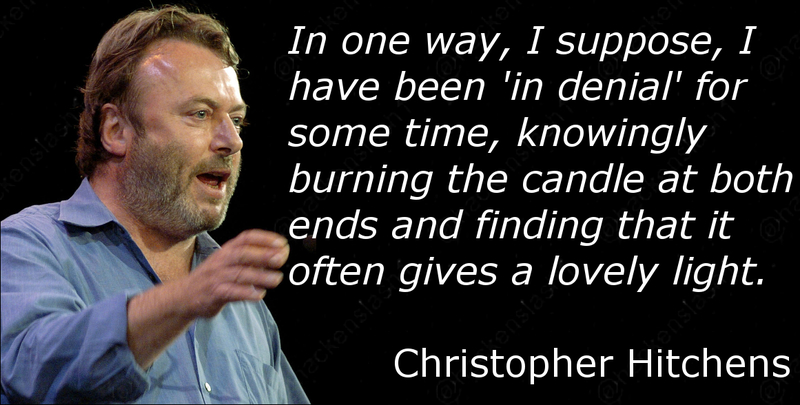 Today is the sixth anniversary of the death of Christopher Hitchens. In tribute, this is what I wrote in one venue on that day. Valé Hitch, you're still sorely missed. Every once in a while, somebody appears in one's life whose influence on one is impossible to calculate. Just such a person was Hitch. For clarity of thought, courage of conviction and, above all, soaring prose to which I can only aspire, Hitch was a giant. Contrary to the written assessments of others, Hitch never changed his political stance. All his statements, from his polemics against the irrationality of unquestioning adherence to doctrinal imperatives to the support of the ousting of tyrants and despots, stemmed from the same core; his social conscience. The latter, especially, oft-misunderstood by many to a quite frightening degree, was consistent from his earliest days to his death. He supported the Falklands war for precisely the same reason that he supported the invasion of Iraq. He saw in Galtieri the same 'evil' that he saw in Saddam Hussein, and his response was the same in both cases. He never swung from the left to the right, he remained rigidly opposed to tyranny wherever he saw it, and was not afraid to voice his opinion, regardless of whether those whose political alignment was similar saw things in the same light, and certainly with no regard to the feelings of anybody who might be offended. As somebody not generally given to hero-worship, eulogising, or indeed to grief, I am somewhat conflicted in writing this. 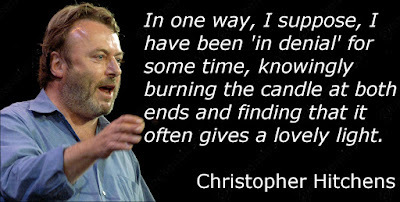 Do I mourn the passing of Hitchens? Not really. I do mourn the prose that will now remain forever unwritten, for the simple reason that he was matchless in this regard, and because there simply aren't enough intelligent books to counter the tide of vacuous drivel, much of which will undoubtedly be written about the man now his light has gone from the world (quite probably including this very piece). And such a light! Rarely have I come across such biting wit, such laser-like precision, such eloquent rhetoric. Journalist Michael J Totten says of him that he was 'the greatest writer of our time, who could talk off the top of his head better than most of his colleagues can write' and it's difficult to erect an argument against this. Author and blogger Ray Garton said of god is not Great that it 'gave me goosebumps when I read it the first time because it read like it had been written by someone who had reached inside my head, rummaged through my thoughts and knew exactly how I felt.' He will be remembered by many as the man who told them it was OK not to believe in nonsense, that it was perfectly acceptable to think one's own thoughts and draw one's own conclusions, regardless of the opinions of the majority of those around us. For my part, I choose not grief (although I do grieve in some measure) at the passing of the man, but a celebration of his life, conducted in the manner in which he taught me, by striving – even if in vain – to match his eloquence, by continuing to stand against the irrational, by simply living. Farewell, Hitch, and thank you.